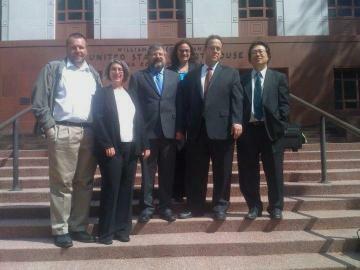 EFF lawyers urged the 9th U.S. Circuit Court of Appeals in Seattle to allow our two lawsuits challenging the National Security Agency's illegal mass surveillance of millions of ordinary Americans to continue. For those who couldn't attend in person, we have the next best thing: video recordings! Check out Jewel v NSA and Hepting v. AT&T. We can't predict when the appeals court will rule on our cases, but we hope it's soon. We've been fighting to obtain a ruling on the legality of the NSA's surveillance program for over half a decade, and are still stuck at the starting gate thanks to the government’s repeated claims of state secrecy and the unconstitutional "immunity" law that Congress passed for the telcos that have collaborated in the spying. Hopefully, the upcoming decisions in these cases will get us a step closer to finally imposing the rule of law on the NSA and stopping the spying. What’s worse than discovering that someone has launched a man-in-the-middle attack against Iranian Google users, silently intercepting everything from email to search results and possibly putting Iranian activists in danger? Discovering that this attack has been active for two months. We're glad to see computer security experts taking the issue so seriously, but for the time being almost all Internet users are still vulnerable to this sort of attack. What has long been an EFF issue is once again making headlines. In recent days, the world is seeing damning reports of authoritarian regimes spying on their citizens using American- and European-made surveillance technologies, with new evidence emerging from Bahrain, Libya, Syria, and Thailand. For years, Tunisians suffered in relative media silence as the Ben Ali regime curtailed digital rights, blocking websites and surveilling citizens. Then, thanks to the hard work of Tunisian free expression advocates, censorship fell along with the regime. However, now Tunisian courts have become the next critical battleground in the ongoing effort for a censorship-free Internet in Tunisia, with the Agence Tunisienne d'Internet (Tunisian Internet Agency) caught in the middle of implementing censorship orders and arguing in support of free expression. After many years and many failed attempts, patent reform legislation is about to pass Congress and become law. The good news: Washington, D.C. recognizes that the patent system is in dire need of reform. The bad news: the new law will do virtually nothing to fix many of the system’s fundamental problems. EFF is happy to report that SB 914, a California bill that requires the police to obtain a search warrant before searching a recent arrestee’s cell phone, passed through the state Senate and is now on its way to Governor Brown's desk. Current Electronic Frontier Foundation (EFF) members and donors are invited to join Director for International Freedom of Expression Jillian York and Senior Activist Richard Esguerra at a secret location in New York City for drinks on Sunday, September 11th. Both Jillian and Richard will be speaking at the Open Video Conference that weekend at New York Law School. Find out about our latest work in intellectual property, online activism in the U.S. and abroad, and EFF's continuing fight to defend your privacy. Over 180 experts from 32 countries and six continents came together to help re-articulate the public interest dimension in intellectual property law and policy. Now they need your signature. Last week, an advocacy group submitted an amended complaint in a case against Cisco Systems, alleging more evidence that the U.S.-based company had customized its products to help the Chinese government abuse human rights. From The Guardian: the government of Pakistan orders ISPs to snitch on users who rely on encryption technology to browse web. Reproduction of this publication in electronic media is encouraged. Signed articles do not necessarily represent the views of EFF. To reproduce signed articles individually, please contact the authors for their express permission. Press releases and EFF announcements & articles may be reproduced individually at will. Jillian York, EFF's Director for International Freedom of Expression, is participating in the seventh annual M100 conference. This year's conference will focus on the role of social networks in connection with the revolutions in Egypt, Tunisia, Algeria and Morocco. Meet EFF Membership Coordinator Aaron Jue at the ninth annual Ohio LinuxFest to be held September 9-11, 2011 at the Greater Columbus Convention Center. Hosting authoritative speakers and a large expo, the Ohio LinuxFest welcomes all Free and Open Source Software professionals, enthusiasts, and everyone interested in learning more about Free and Open Source Software. EFF's Director of International Freedom of Expression, Jillian York, will be the keynote speaker at this year's OVC. Jillian will speak about the role of video in enabling activists around the world along with the inherent risks that it also creates. Current Electronic Frontier Foundation (EFF) members and donors are invited to join Director for International Freedom of Expression Jillian York and Senior Activist Richard Esguerra at a secret location in New York City for drinks on Sunday, September 11th. Bowie State University will host the third annual Humanities and Technology Association Conference, which will look at the impact of technology in society. EFF's Director for International Freedom of Expression, Jillian York, will be the keynote speaker for this event. Join EFF Activism Director Rainey Reitman, Paromita Shah of the National Immigration Project, and Imad Hamad of the American-Arab Anti-Discrimination Committee in a discussion about the social, political, legal, and ethical implications of increased online government and private sector surveillance in the wake of the tenth anniversary of 9/11.